We are so lucky to have these training days at our disposal and I know we all found Darrell very clear and easy to understand and he produced amazing consistency in his methods throughout the day. His main ethos is ‘to give the horse a better ridden experience’ and as a trainer ‘to say the right thing at the right time’ – his Badminton tale ( too much would be lost in translation to repeat here ) had me chuckling for days. Controlled forward movement with rhythm and bend in all paces was how we began the mornings jumping session. Using the rhythm to allow the horse to remain in balance and stay calm. On Monday September 30th, Cherry Elvin kindly organised a morning for Members (and friends) to visit Emile Faurie’s Yard. It was an action packed morning with Emile giving us the opportunity to observe the training of six different horses ranging for a lovely 3 year old to Topolino, his GP horse. The first horse was a 3 year old that he bought as a foal and had been backed approximately 8 weeks. It was great to see the confidence that this horse had whilst being handled, lunged and then ridden for a short time. A Small group attended a course walk at Blenheim CCI3* organised by the BHS F&I Association with course designer Eric Winters, who kindly gave his time free of charge. The money collected has been donated to the Kenneth Clawson Memorial Fund. 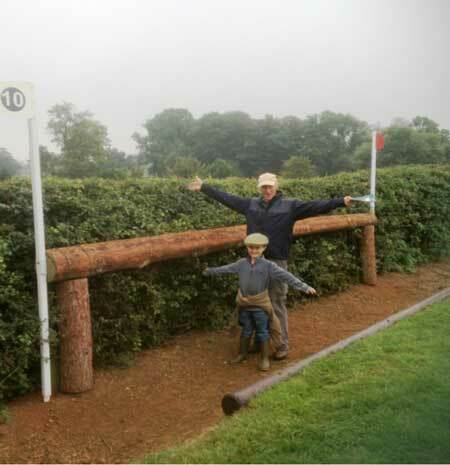 The aim was to walk the course and understand the philosophy behind designing a course of this level at this time in the eventing calendar coupled with the constraints of running in a parkland environment catering for a commercially run venture.